Free Shipping Included! 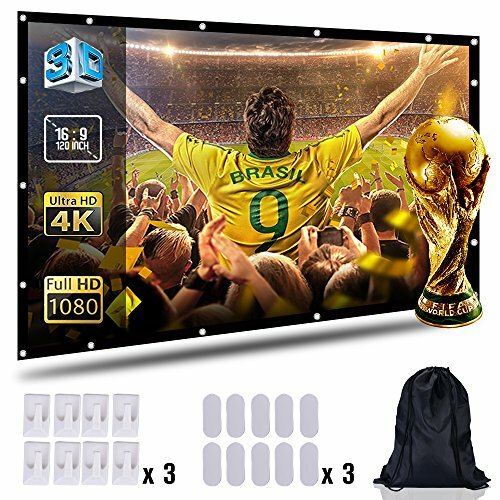 Projection Screen 100'' inch 16:9 Moive Screen HD Ready for Home Cinema Theater Presentation Education Outdoor Indoor Public Display Support Double Sided Projection with Bag by CableGeeker at Home Entertainment Centers Online. MPN: CG-TYMB01-100. Hurry! Limited time offer. Offer valid only while supplies last. PREMIUM QUALITY: To ensure you get the BEST HD video experience, we design our Projector Screen with thick & light-proof, soft polyester fabric & top-quality spandex. The screens can be used on both sides. ANTI-CREASE: With 4 extra holes on all 4 sides in our latest design, we've ensured this Foldable Movie Screen will tightly fit & snap onto frames easily. This upgraded design offers a superior watching experience. No more wrinkles! SUPER-EASY INSTALLATION: Each Dual-sided Projection Screen package comes with a pouch, hooks, ropes & Velcro. Set up in just minutes! No frame assembly required. Choose required accessories to suit your needs & snap into place! ULTIMATE VIDEO EXPERIENCE: With 1.5in black border on all 4 sides, you will get stunning picture contrast & reduced vertigo when using this Projection Screen. Perfect for home theater, conferences, schools, wedding exhibition or outdoor activities. EASY MAINTENANCE: To eliminate wrinkles after folding, simply stretch out your projection screen until flat & get started! To clean, wipe your Portable Screen with wet cloth & immediately air dry. DO NOT WASH to avoid wrinkles or damage. If you have any questions about this product by CableGeeker, contact us by completing and submitting the form below. If you are looking for a specif part number, please include it with your message.